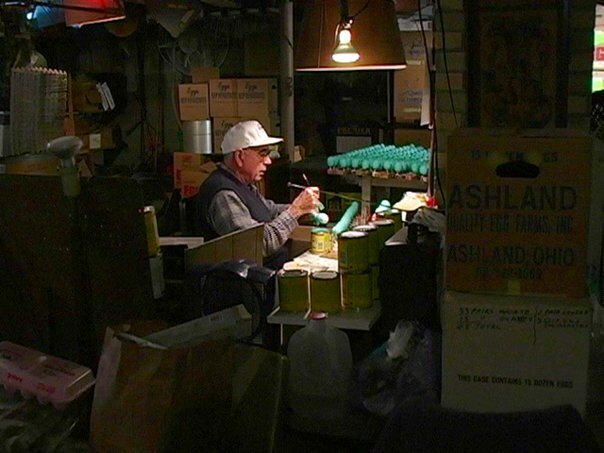 Over the years, what would become known as Eggshelland continued to grow…and grow. 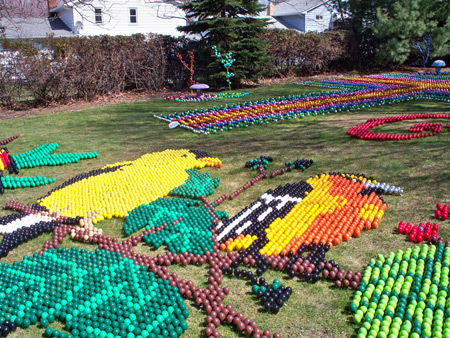 Every year, the number of painted eggs would double, triple, and even quadruple until displays often needed upwards of 40,000 eggs. 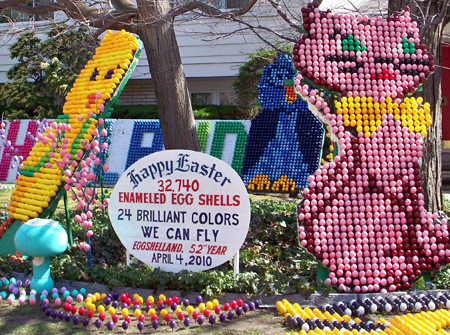 And every single one of those eggs were cracked and drained by Ron and Betty, then given three coats of color by Ron, before they ever made it to the display. And every Palm Sunday, come heck or high water (or Spring rain and, sometimes, snow), an enormous display would go up on the Manolio front lawn, disappearing just as quickly a few days after Easter. But during that week, hundreds upon hundreds of people would flock to the house on Linden Lane to gaze at the breathtaking sites. I first became aware of Eggshelland when it appeared on a list of potential locations to be covered in my 2005 book, Weird Ohio. As soon as I saw the first pictures from Eggshelland, I fell in love with the place. It was something right up my alley. It was strange. It was bizarre. It was one of the most unusual things I’d ever seen. Above all, it was beautiful. I also found the story of how, year after year, husband and wife worked side by side to create Eggshelland, to be one of the most romantic things I’ve ever read. 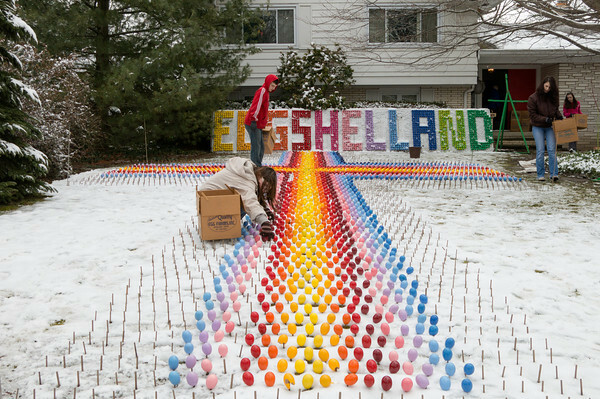 But the most endearing thing about Eggshelland was how the whole thing would come together on the front lawn. 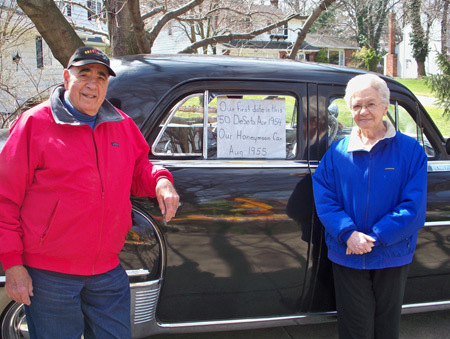 Every year, Ron, Betty and the entire Manolio family–Ron and Betty’s children, grandchildren, and even in-laws–would gather and painstakingly put the display together. Even neighbors would stop by to lend a hand. Countless hours spent crawling around in the yard with only one goal in mind: to make the people who stopped by to see the display, many of whom were strangers, smile. Sadly, Ron Manolio passed away suddenly in 2012. Shortly thereafter, the Manolio family announced that they would be doing one last Eggshelland in 2013 as a tribute to Ron. I can only imagine the range of emotions the entire family is going through as they create the Final Eggshelland. I bet there are numerous times when they just feel like giving up and walking away. But they don’t. That’s because they know it’s not what Ron Manolio would want. Perhaps that’s why, coming across a photo posted on the Eggshelland website recently, I was reduced to tears, even though the smile never left my face. It shows Ron’s family, braving the snow in order to ensure the 2013 display is ready for Palm Sunday. You are cordially invited to visit Eggshelland, where the family of Ron & Betty Manolio will be supplying you with smiles, happiness, and memories. For free. ← My Calendar’s Starting To Fill Up!